Fashion for book covers « "TeresaBruceBooks"
For a minute yesterday, I thought I was having an 80’s flashback. My publisher invited me to help her pick out headbands and gold foils. Seriously? 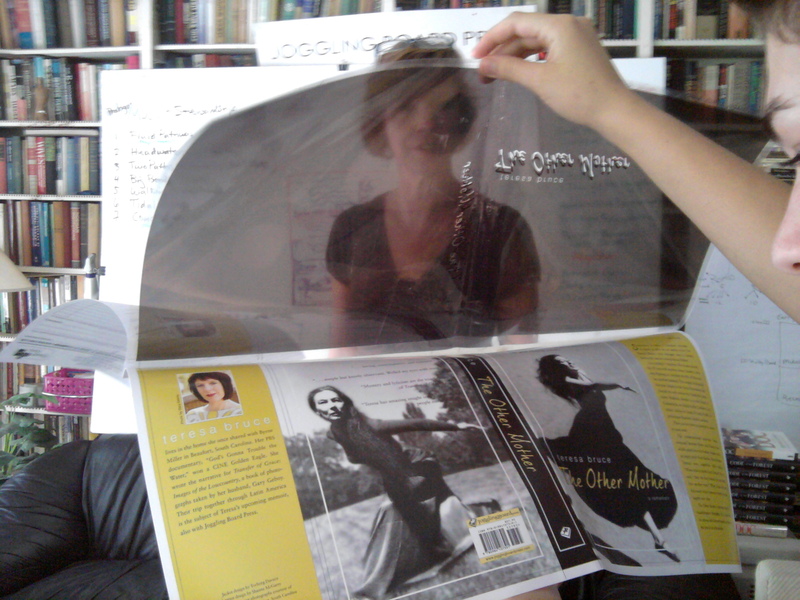 That’s Susan Kammeraad-Campbell, my editor and publisher, peering through the overlay that represents everything embossed and shiny on the cover. “The Other Mother” lettering will be raised; I’ve figured that much out. And a little shiny — though I’m sure Susan’s cringing as she reads. It’s actually called spot laminated something or other. Here comes the headband part. I wasn’t kidding. See that striped red and gold piece of fabric at the base of the book’s spine? It’s called a headband. I’ve never noticed them before, but that’s because they’re normally a boring black or grey that blends in with the hardcover. Nothing bland or ordinary will do for “The Other Mother” — if Byrne Miller ever wore a headband I’m sure it was as groovy as our gold and magenta pick. See all the little gold medallions I’m holding? 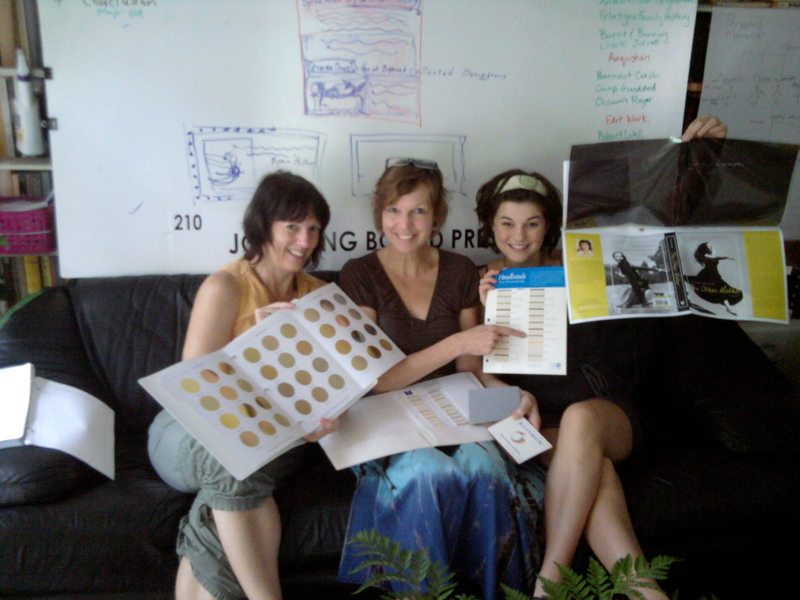 Intern Sylvie (on the right) helped me pick the perfect shade of gold to serve as “The Other Mother” lettering on the cloth-like interior cover. 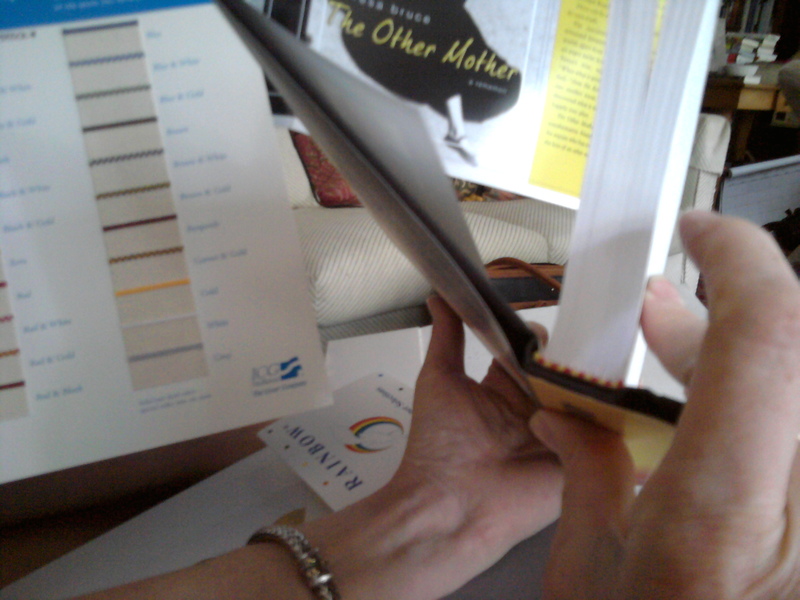 It had to complement that gray swatch Susan’s holding in the middle — if you ever lose the dust jacket on this hardcover you’ll still have an elegant, modern looking hardcover for your bookshelf. This entry was posted in travel and tagged publishing, The Other Mother. Not sure whether Will is referring to the book, the blogger or the book fashionistas, but I’d say it applies to all. You CAN judge a book by its case cover and Smythe-stitch construction. When you hold Teresa’s book in your hand, I promise you the matte lamination on the jacket will make you want to stroke “The Other Mother” like a kitten. Uh. Wait. That came out funny . . .